Amazon released a new update for the K3 Wifi and K3 3G yesterday. This is definitely one that you shouldn't wait for. Go get it (here). The update give the K3 the same Kindle Cloud support that you can find on the K4. Do you know how Amazon save a copy of every ebook you buy from them as well as the attached notes and highlights? Well now you can do that with your personal documents on your K3. Amazon launched the Kindle Cloud with the K4, and that's when they started doing the same thing with personal documents that they did with the ebooks they sold you. You have 5GB of online storage for your personal documents which you can fill with however many Kindle ebooks or PDFs you wish. Any notes that you add to the uploaded docs will also be saved and synced across the K3 and K4 (and Kindle Touch when it is released). I don't know about you, but that's a feature that I've wanted ever since the original Kindle. BTW, this is very good news for anyone who likes the keyboard on the K3. 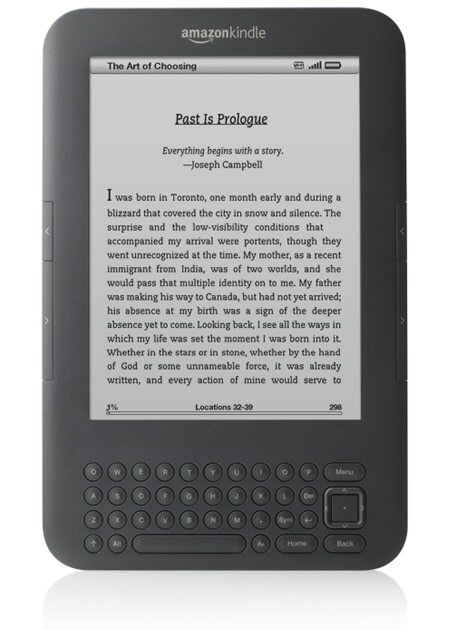 It's a sign that Amazon plan to keep the K3 around indefinitely as one of their ebook readers. After all, they wouldn't have gone through the expense of updating the firmware if they didn't plan to continue to sell it. Now, Amazon did say at the press conference that they were keeping the K3, but I wasn't really sure what they meant. The previous Kindle models were still around for some months after they were replaced, and the K2 was in fact still available as a refurb almost a year after the K3 launched. So it's my guess that the K3 will stay on the shelf until at least next year. Amazon will likely launch new and updated Kindles at some point, and that's probably going to be when the K3 is EOLed. For more Kindle news, subscribe to the RSS feed or the daily email newsletter. You can also follow me on Twitter: @thDigitalReader or find me on FaceBook. With no encryption this is a privacy hell. Hmmm…and what about the Kindle DXG ? Dead meat ? Maybe. But then I wouldn’t have thought that the K3 would get an update. What I really want is for my synced file to appear in my cloud reader/kindle/phone and be able to sync to the farthest page read, like I’ve been able to do for books purchased from Amazon. It apparently doesn’t look like this is happening, but hopefully someone will correct me! James, I received an informational email from CS that said in part: “Now (just as with Kindle books) Whispersync automatically synchronizes your last page read, bookmarks and annotations for your documents (with the exception of PDFs) across devices.